Typical isn't it? You wait around for a story about conjoined twins and then two come along at once. Just a couple of weeks ago at the London Film Festival I enjoyed Indivisible. The film followed conjoined twins Viola and Dasy, who spend their days being gawked at, singing musical numbers and debating whether they should be separated. Then comes Side Show, a musical about conjoined twins Violet and Daisy (Laura Pitt-Pulford & Louise Dearman), who spend their days being gawked at, singing musical numbers and... well you can probably see where this one is going. The musical is a broad biography of Violet and Daisy Hilton, best known for their appearance in Tod Browning's 1932 classic Freaks. We follow them from exploitation in a travelling freakshow alongside bearded ladies, a half man/half woman and a three legged man. They live a miserable existence of sexual exploitation, humiliating performances and violent belt-based discipline. Life looks miserable as hell until vaudeville promoters Terry (Hayon Oakley) and Buddy (Dominic Hodson) arrive, liberating them and propelling them towards mainstream success. But though the costumes are glitzier and audiences snootier, have they really escaped the objectification of the freakshow? From the first number Come Look at the Freaks we're tossed into an old-timey and, by contemporary standards, pretty offensive circus show. Messing with gender boundaries (the Bearded Lady (Lala Barlow) and the Half Man Half Woman (Kirstie Skivington) is shocking, deformity is something to be stared at and pitied and a black guy is reduced to dressing up in some ludicrous cannibal costume and beaten on stage. Perhaps even weirder is the Tattooed Girl (Agnes Pure), who seems incongruous in a circus setting (in 2016 she'd be more at home serving coffee in Shoreditch). Director Hannah Chissick accentuates the circus atmosphere with thrust staging; allowing the performers to be seen from almost all angles. This all but invites us to gawp at the (simulated) on stage freaks. We look down our noses at the leeringly insensitive 1930s audiences, yet the show gently makes us feel like hypocrites. After all, we're the ones who've turned up to watch a high-kickin' rah-rah show about conjoined twins (though here their conjoinment appears to by a couple of safety pins). This indictment eventually gets ladled on a bit too thickly. As the cast sings "come look at the freeeeaks" they put up mirrors in front of the audience as if to say 'ah, is it not you who are the real freaks?' Well, 'Lizard Man' and 'Dog Boy' it's an interesting hypothesis, but I still kinda think the freaks might be you guys. Mind you, not that there's anything wrong with being a freak. That's the cheesiest moment in a show that bazookas its message at us with little subtlety or nuance. Ultimately, Side Show's moral lesson that people with disabilities are individuals in their own right rather than curiosities to be stared out is a bit obvious. Similarly, the show has its cake and eats it by refusing to flesh out its secondary characters. For all the preaching empathy and understanding, within the context of the show the Three Legged Man is still just someone to stare at and think "ooh, that's a bit weird." On top of that, Bill Russell's book is yer typical by-the-numbers musical theatre dreck. Sometimes I feel like I'm really missing something when I'm watching shows like this - looking on with confusion as a rapt crowd applauds yet another cookie-cutter ballad or plodding lyrics overstuffed with terrible forced rhymes. On top of that the performances are comprehensively sucked dry of personality: close your eyes and this cast could be any white-toothed gaggle of stage school grads (with the exceptions of Chris Howell and Jay Marsh). It's not that I don't enjoy musical theatre. I just don't like most of them - give me something with a little personality like Little Shop of Horrors or Matilda. Side Show is essentially a procession of hammer blow to the head songs with as much musical intelligence as a tractor, quickly leaving me trapped in bleary eyed boredom. After the show I learned that Side Show's main reputation is of being a notable flop - having crashed and burned twice on Broadway. Please, someone slap a 'Do Not Resuscitate' tag around its neck(s) so nobody's tempted to have another go. 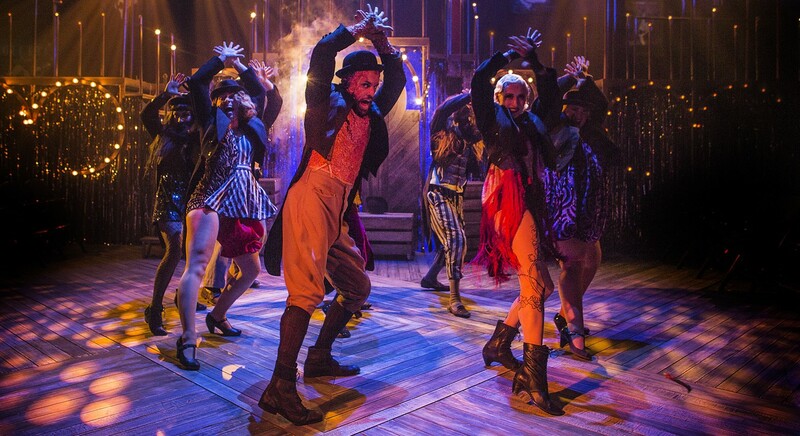 Side Show is at the Southwark Playhouse until December 3rd. Tickets here.